This blog is being written as I attend my last Board and Annual General Assembly meeting as vice-president, Equity Issues, for the Canadian Federation for the Humanities and Social Sciences. The meetings coincide with the delivery of the 2012 federal budget. Canada’s Finance Minister Jim Flaherty is expected to deliver a 2012 federal budget that will make significant investments in Aboriginal education. There is national consensus on the need for substantial investments to close the funding gap between Aboriginal and non-Aboriginal students and, particularly, between students in on-reserve schools and those in provincially administered schools. While there is some debate about the size of the gap, there is wide-ranging consensus that, at least since 1996, the gap has existed and it has profound implications for access, the quality of education and the outcomes. ,” all national Aboriginal leaders and organization have consistently called for the prioritization of Aboriginal education, employment and economic development. This educational priority was mirrored in the platforms of the federal parties. Moreover, this past February 2012, a New Democratic Party sponsored resolution that called for educational equity – “at a minimum, of equal quality to provincial school system” – received unanimous support in the House of Commons, signalling a national consensus that the success of Aboriginal students was important for Aboriginal communities and for the future of Canada. Assembly of First Nations Chief Shawn A-in-chut Atleo, a University Chancellor, has been a tireless champion of Aboriginal education and has proposed a bold education plan that calls for an injection of $500 million. While the federal response to this call will become clearer in the days ahead, it is expected that, minimally, much-needed resources will be directed to educational access, to Aboriginal curriculum and teacher training, to cultivating and mentoring the next generation of Aboriginal leaders, and to regional educational infrastructure. Last year at Congress 2011, held jointly at the University of New Brunswick and St Thomas University, there was a full week of programming under the theme, “Transforming the academy: Indigenous education,” with Chief Shawn Atleo, as the Big Thinking Equity keynote as well as five equity issues panels. These events, captured on video and podcasts, identified many of the key issues, challenges and possibilities facing First Nations, Inuit, Metis and Non-Status Indians. In the lead up to Congress 2011 and since, topical conversations have taken place on ‘Equity Matters,’ on the Fedcan Blog. I’ve edited a series on “Aboriginal education and Indigenizing the academy,” which is currently being edited and converted into an e-book for teaching and learning. Congress 2010 held at Concordia University in Montreal included a panel, “The Status of First Nations, Metis and Inuit Women,” and featured President of the Inuit Tapiriit Kanatami Mary Simon, President of the Quebec Native Women’s Association Ellen Gabriel, and Canada Research Chair in Traditional Knowledge, Legal Orders, and Laws at Athabasca University Tracey Lindberg. And, at Congress 2009 held at Carleton University in Ottawa, the Equity Issues programming included the panel, “Decolonizing the Academy: The Status of Aboriginal Peoples and Education,” with Indigenous scholars Joyce Green (Regina), Rauna Kuokkanen (Toronto) and Makere Stewart-Harawira (Alberta). With the collaboration of the communications team and CFHSS’s Policy Analyst Karen Diepeveen, many of these important sessions have been digitized. The videos and podcasts are available for public education and for use in teaching and learning (the links are included below). Canada’s First Nations are the youngest and fastest growing population in the country. Yet the education gap between First Nations Canadians and all other Canadians is real. Their social and economic future is Canada’s. In a recent call-to-action, the National Chief of the Assembly of First Nations made a passionate plea to all governments, education institutions and private and public sector organizations to support his vision, one that will provide a foundation for growth for the next generation of First Nations Canadians. Chief Atleo called for the injection of an additional $71-billion into the Canadian economy over the next 10 years in order to benefit from an under tapped pool of talent. National Chief Shawn Atleo is a Hereditary Chief from the Ahousaht First Nation. For this 2011 Big Thinking Equity keynote event, Chief Atleo shares his vision for Aboriginal education and charts the steps needed to achieve a more accessible, equitable and supportive post-secondary education system. Is it possible for Canada to close the education gap between Aboriginal peoples and other Canadians? How do the stories and experiences of Aboriginal communities vary across Canada? What strategies are needed to pave the road ahead? To answer these questions and many more, the Federation’s Equity Issues Portfolio invited a group of Aboriginal leaders to reflect on their experiences and imagine what the future will hold for Aboriginal peoples. These panellists include: Udloriak Hanson (Special Advisor to the President of Inuit Tapiriit Kanatami), Betty Ann Lavallée (National Chief, Congress of Aboriginal Peoples), Marie Battiste (University of Saskatchewan), Jo-ann Archibald (University of British Columbia), and David Newhouse (Trent University). How do we support teaching and learning Indigenous knowledge in the academy? This panel explores the interrelated issues of learning, creating and disseminating Indigenous knowledge. It also identified the important opportunities to Indigenize the academy. This conversation brought together an interdisciplinary panel of experts: Kiera Ladner (Manitoba), Dwayne Donald (Alberta), Shanne McCaffrey (Victoira), D’Arcy Vermette (St. Thomas) and Andrea Bear Nicholas (St. Thomas). What are the best strategies to encourage the emergence of the next generation of Aboriginal academic leaders, before and during their university experience? This panel explores the initiatives already in place, while offering up suggestions as to how to increase the success of Aboriginal scholars. Participating in this roundtable are Susan Aglukark (Distinguished Scholar in Residence, University of Alberta), Malinda S. Smith (Alberta, CFHSS Vice-President, Equity Issues), with Isabel Altamirano-Jiménez (University of Alberta) chairing the conversation. As Canada emerges from the global recession, governments are focusing on the task of financial recovery. What will be the impact on existing equity programs? Will the fight against deficits undermine our nation’s commitment to equity, diversity and justice? Do economic crises weaken equity programs or give rise to new opportunities? This roundtable considers the opportunities, as well as the challenges, around achieving equity in times of economic upheaval. Participants include Aloke Chatterjee (New Brunswick), Donna Pennee (Western), David Perley (New Brunswick and St. Thomas) and Len Findlay (Saskatchewan), with Malinda S. Smith (Alberta, CFHSS Vice-President, Equity Issues) chairing the discussion. The speakers on the 2009 plenary panel, chaired by Malinda S. Smith (Alberta, CFHSS Vice-President, Equity Issues), included Joyce Green (Regina), Rauna Kuokkanen (Toronto), and Makere Stewart-Harawira (Alberta). Joyce Green, the author of Claiming Space for Indigenous Feminism, spoke on the topic, “Inclusion or Transformation? Indigenizing the Academy.” The presentation suggested that the inclusion of Indigenous peoples into the academy functions to destabilize the preferential knowledge and power relations inherent in elite education in settler states. It proposed that dominant notions of ‘inclusion,’ while preferable to exclusion, can operate to legitimate the colonial fact, and fail to educate sufficient numbers of students to be transformative. Moreover, the pressures of compliance with elite western canons and with institutional mechanisms function to erase the radical transformative potential of Indigenous thinkers in universities. It suggests a better option is the indigenization of the academy, a process that substitutes transformation for inclusion, in ways that change the canons and the institutional processes. The end result would be a more universal knowledge framework. An indigenized academy would be better positioned to educate Indigenous and non-Indigenous students and to teach the essential qualities of citizenship and democracy in settler states. Makere Stewart-Harawira, author of The New Imperial Order: Indigenous Responses to Globalization, presented on the topic, “Indigenous Knowledge and Scholarship and the Political Economy of Decolonization.” Stewart-Harawira framed her discussion against the backdrop of her own diasporic experience as a Maori scholar within a western Canadian University. She began with some personal reflexivity regarding her somewhat naive initial assumptions and interactions in this context, with the aim of providing some useful insights into the challenges faced by Aboriginal scholars ‘out west.’ This reflexive exercise also framed her consideration of the decolonization and Indigenization of education and research in the context of the emergence of knowledge capitalism, the internationalization of the university, and a highly volatile global economy. She concluded her discussion with some musings on the meaning and nature of decolonization in the contemporary global moment and the potential role of the university. 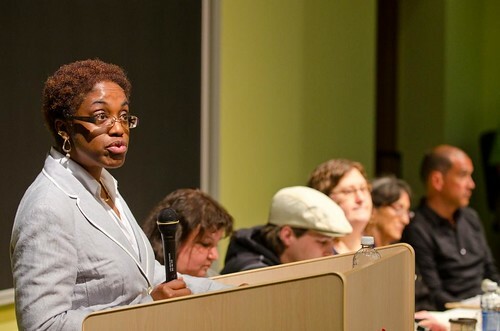 Malinda S. Smith is an associate professor of Political Science at the University of Alberta and was Vice-president, Equity Issues, at the Canadian Federation for the Humanities and Social Sciences (2009-2012).